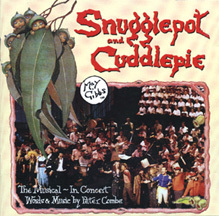 In 1992 Peter embarked on a massive project; to adapt May Gibb's classic story 'Snugglepot and Cuddlepie' into a full length musical. In March of 1993 it was performed at the Adelaide Festival Theatre featuring such artists as Keith Conlon, Catherine Lambert, Eric Bogle and Ruth Cracknell. It was recorded and released as a CD in that same year through Rascal Records.